We’re in the fallow time of year, at least in terms of events, and I’ve been remiss due to my pre-occupation with my new grandson. However, it’s time to tee it up and get somewhat current with golf “stuff”. Let’s swing through the news to see what is in play. Ryan Armour got his 2018 year off to a good start with a 20th place finish in the Sentry Tournament of Champions with a score of 285 (-7). As the name would indicate, this is a pretty select field (34 players) comprised of PGA tournament winners from the previous year. The event was won by Dustin Johnson at a score of 268 (-24) . Dustin finished in 3rd place in the 2017 PGA Tour player of the year standings. Yes, Ryan finished well back of Dustin, but Ryan finished ahead of the 2017 PoY winner Justin Thomas and PoY 4th place finisher Hideki Matsuyama. 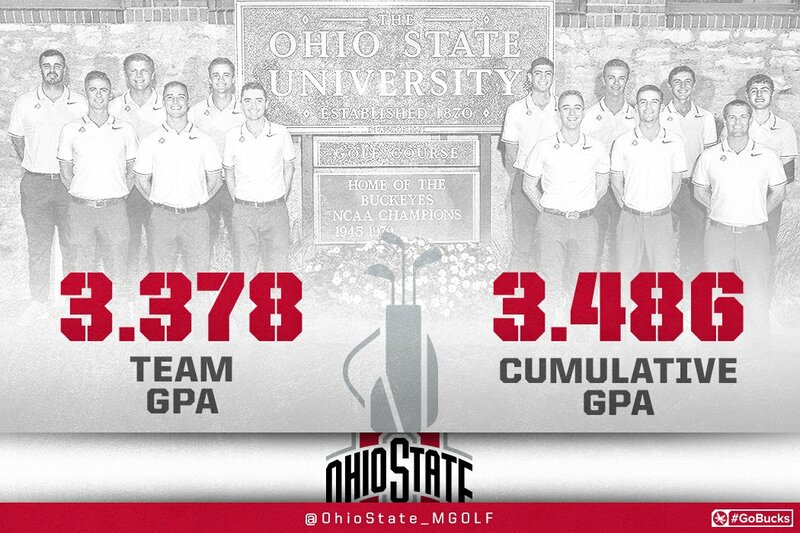 That’s some impressive GPAs, gentlemen. Well done. I have a couple of items, but let’s start with the big news. First, Buckeye alum Rachel Rohanna is with child. In fact, when she won the season ending Symetra Tour Championship, she was six weeks pregnant. You’re thinking what I’m thinking; there has to be a Vlasic endorsement upcoming for Rachel. Congratulations to Rachel and her husband. Next, another Buckeye alum, Katja Pogacar, has earned her status on the Ladies European Tour (LET). This is a big deal and an impressive accomplishment. Katja will greatly benefit from this experience. Not being content with this, Katja aspires, as Slovenia’s first player on the LET, to represent her country in the 2020 Olympics. Good luck in 2018, Katja. Earlier in the week, two of my very good friends, Frank and Mike A, and I met at one of the local golf domes to slap around a few shots and enjoy some camaraderie. This was the first time I’d swung a club since late October. There was still some rust that needed to be knocked away, but I found, again, something interesting. In my first few “warming up” swings I was really compressing the ball with solid contact. Things then got a bit spotty, then reverted back to solid contact. This confirms, to me at least, that once you begin your address routine, your mind needs to go into ‘subconscious’ mode. Otherwise, conscious mind-body tend to get in the way of good swings. Obviously, this will have to be verified with weekly gatherings at The Dome with Frank, Mike A and, hopefully Mike P. It’s exacting research, but someone as to do it. Ryan Armour is currently playing in the PGA’s Sony Open in Hawaii. I’ll have recap early next week. Bo Hoag has a Web.com Tour event January 13-16. Recap to follow.